Home Unlabelled Reports: Southampton has refused to do Buisness with Liverpool on VanDijk! Reports: Southampton has refused to do Buisness with Liverpool on VanDijk! It seems like Southampton are not backing down over Virgil van Dijk. The Dutchman may have his heart set to Liverpool , but it is looking more and more unlikely that he’ll get it. Liverpool remain hopeful that the Saints will have a change of heart and decide to listen to offers for van Dijk - giving the Reds the green light to make a club-record bid for the defender. 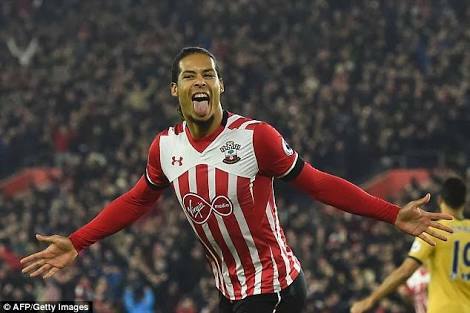 According to Yahoo Sport, who cite sources close to the Saints, club chiefs are adamant that they will not sanction the sale of another player to Merseyside and that means van Dijk may have to consider offers from Man City or Chelsea. The champions, in particular, are said to be eyeing a move for the defender, with boss Antonio Conte so far unhappy with the club's transfer business this summer. In fact, Southampton are still hopeful he has a change of heart and stays put. Liverpool’s chances of landing the 26-year-old now look remotes - unless he digs his heels in and continues to sit on the sidelines in protest. Van Dijk took no part in Southampton's pre-season games and continues to train with the club's youth team.